We’re sponsoring SQL Saturday , Kansas City! Have you heard about SQL Saturday? This is one of the most exciting events for SQL Server professionals & those wanting to learn more about the technology. We’re excited to announce that KC IT Professionals is a silver sponsor for this FREE all day training event on October 2nd @ Cerner’s Riverport Campus! 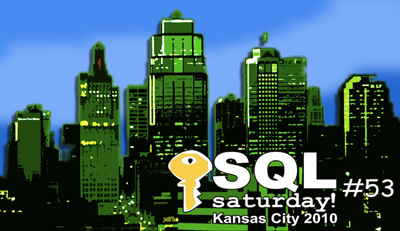 We’ve worked alongside the KC SQL Server User Group to bring this event to Kansas City. Come and learn more about SQL Server, share your knowledge with others and network with other SQL Server professionals in the area and around the nation. The stats so far: we’ve got over 280 people registered to attend! 60 Sessions on various topics were submitted by numerous national & local SQL Server experts including: 2 Microsoft Certified Masters, 5 SQL Server MVP’s, etc! We accepted 41 sessions and have several tracks geared towards beginning & advanced DBA topics , Datatabase Developer & Business Intelligence. SQL Server in Healthcare – Healthy Relationship? To register for this event, go here ! Spur a chain reaction in KC's startup domain! Vote for Infegy as Businessweek.com's "Best Young Entrepreneurs" for 2010!